Green Oolong Rock White White Jasmine Black Dark Yellow Good Night! White Chrysanthemum is no doubt the best known flower used as a drink. It originates from a lovely small town called Tong Xiang, north of Zhejiang. Tong Xiang people have over two thousand years of history cultivating chrysanthemum. 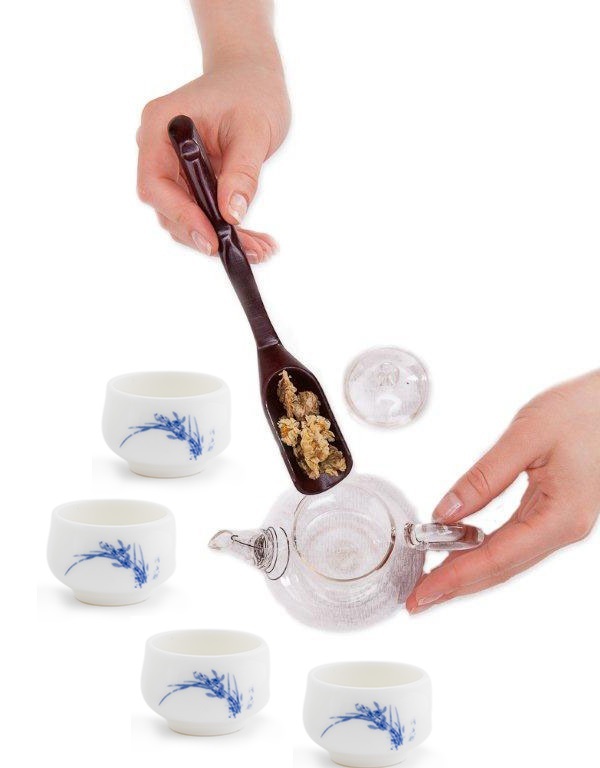 Its White Chrysanthemum tea has been a tribute to the emperors since the Southern Song Dynasty (1127-1279). Tong Xiang lies in the middle of the rich agricultural ”golden triangle” areas with good soil and plenty of rainfall (yearly average 1176mm). The natural conditions are ideal for chrysanthemum plantation. Top quality White Chrysanthemum is harvested from late October onwards. The fresh flowers are processed into tea first by hand and then by a modern microwave airflow- drying technique. In Chinese history, White Chrysanthemum is used as a medicine and a drink as well. It contains several kinds of vitamins, amino acids, minerals and antioxidants. 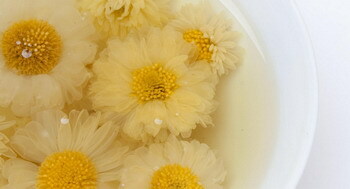 Our selection is composed of unbroken, lively yellowish white chrysanthemum. Steeping in hot water, the flowers open up in a complete form, its infusion appears bright and golden. The flowers remain perfect even after 24 hours in water. The tea is tasty and fresh, blended with honey-sweetness and a slight bitterness. A fantastic health drink! A glass Gaiwan or A glass teaport is the best. 95-100℃ water (the softer the water, the lower the temperature). Refill up to 4-5 times. Smell the inside of lid - chrysanthemum aroma!